FASHFEST has announced that this year they will put forward not one, but two Faces of FASHFEST. In contrast to previous years, the organisers have chosen two young and relatively inexperienced models, 17-year-old Dickson College student Hannah Clare McKenzie and 21-year-old University of Canberra Student Ken Scruton. The first Face of FASHFEST, Anneliese Seubert, was 39 when she represented the event in 2013. An experienced model, she had previously walked for Alex Perry at Mercedes-Benz fashion week in 2010. Last years’ Face, Belinda Riding, was a veteran of the catwalk, having began her modeling career in Canberra in 1987. 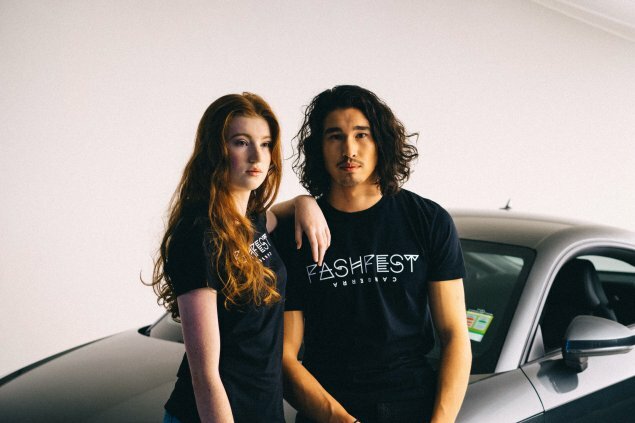 In contrast, this year’s FASHFEST organisers have chosen up-and-comers Hannah and Ken, who are just starting out in the world of fashion. The change of approach is not just a way to keep things fresh, but also a vehicle for fulfilling one of FASHFEST’s main goals: to encourage and support growth in the local creative community. Andrea Hutchinson, co-founder of FASHFEST and HAUS Models says that the event is always evolving. “In line with FASFHEST’s commitment to growing Canberra’s creative industry, we decided to take an innovative approach and pick not one, but two Faces. We’ll work closely with the models to develop their skills. Both Faces will win a year contract with HAUS Models and Sydney’s WINK Models to advance their careers,” she says. While they certainly have big shoes to fill, these two stunning young things are hoping to make their mark on the local fashion scene. “I enjoy the challenge of being given an idea to work with and being able to help designers fulfil their visions,” Hannah says. Ken, having walked at FASHFEST’s inaugural event in 2013, is looking forward to being a part of the mayhem again in 2015. “I was impressed with how well FASHFEST was run, especially because it was the first year when I modelled and I thought there would be more hiccups. It was crazy and ridiculous, with clothes flying everywhere, but essentially everything ran so professionally and smoothly,” he said. Although both Faces are young, tall and confident on the catwalk, Hannah and Ken both have strikingly unique features. It’s great to see that FASHFEST is keeping one thing the same, and that’s its commitment to celebrating diversity. It has been a welcome relief over the years to see all kinds of different ages, sizes, heights and nationalities represented in the model selection, in comparison with other fashion shows which feature thin, white, tall and young men and women – almost exclusively. I’m looking forward to seeing the remainder of the modelling contingent strut their stuff at the National Convention Centre come opening night, and trust that they’ll be just as diversely beautiful as always. Yeah they are really supporting emerging talent by charging over $1000 for a designer to participate.